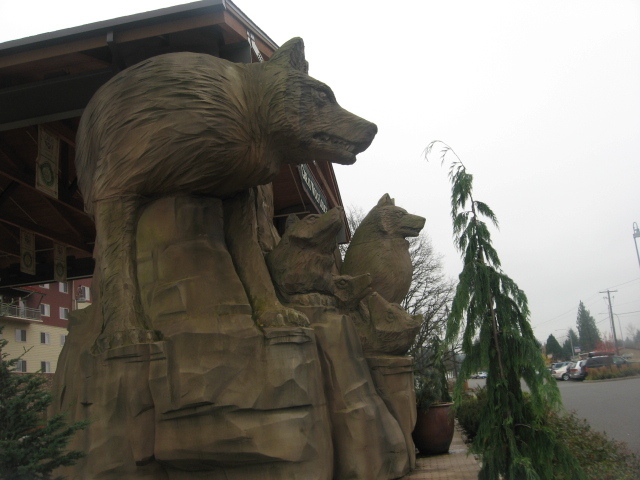 We took Amtrak to Centralia, WA and then Centralia’s little bus service to Great Wolf Lodge on Sunday and came back Tuesday. This was a Village Home field trip and we did get the group rate, but since we were sort of separated from the group due to where they put us in the Hotel and transit issues, we did not see a single VH person on the trip. (We saw one kid and his mother who passed by quickly.) 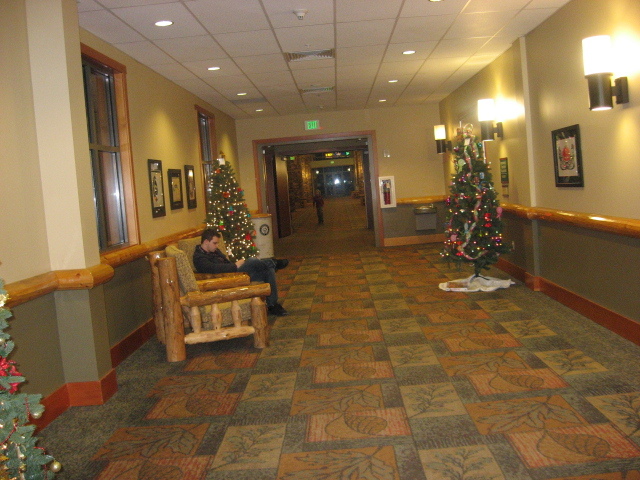 We were put on the Lobby level because of Sully, and then we could not participate in their dinner because it was back in Centralia and at that time there was no busses. We checked at their other meeting places by the pool and in the lobby for games, but no luck. I know they also met at some restaurant half way back, but of course we couldn’t do that because of the train. This kind of stuff is typical for us. Happens all the time, so it isn’t that big of deal. They drive down more or less as a group, and then they change plans as needed and we are not informed. It is a good thing we didn’t make too big deal about it, because the kids didn’t seem to care. The funny thing was, we saw another family we knew, Lisa P., Orion and Akasha, who just happened to be there, and the kids ended playing with them. Then they met these homeschool kids from Seattle, and played with them a bit, and had a big scientific discussion with experiments while in the outdoor hot tub about evaporation and condensation. Only homeschoolers. One reason we might have missed them is that when we got there on Sunday, we had to take the 8:30 train and then got to the Lodge by 11, but we couldn’t get into our room until 4. The first problem was that although everyone else can keep their luggage in their vehicle and then just take a few things out and go to the watermark or whatever, we could not with all of our stuff on us (they refused to offer baggage holding for us, I plan to fight that next time.) We only had four backpacks, the stroller and ourselves. But nowhere to put our things, while we swam. It wasn’t really conducive to just piling them somewhere, unless you wanted to get everything soaking wet. The other problem was, and I felt bad about this, was that dispute really trying, I had only slept about three hours in the past 48, I think because of job, OCB stress I guess. 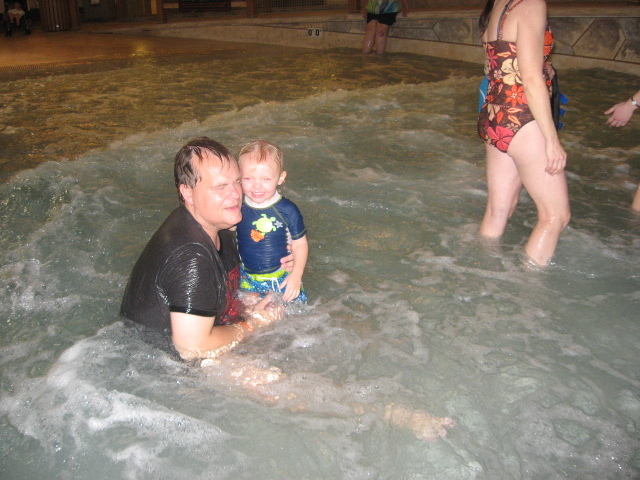 I was so tired that I didn’t feel like I could safely watch all the kids in the pool. I mean, my brain was starting to misfire. I couldn’t figure out left and right and simple things. 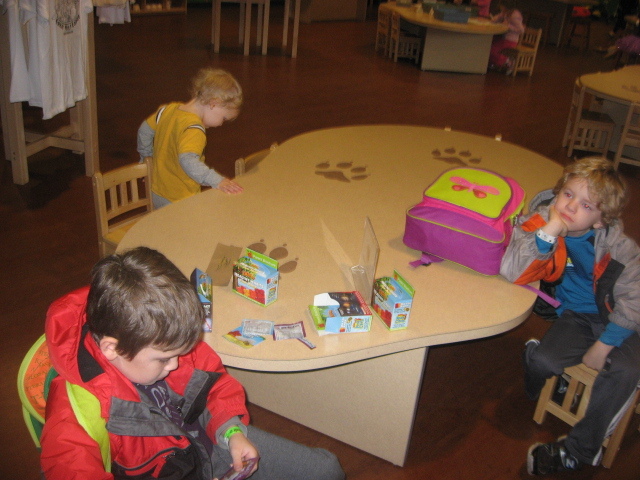 We ended up taking the kids to this art/playroom and they played there for a bit. One of the staff there was talking to us and felt so sorry for us that she called and got a room for us early, by 1:00. Then Avery and I took a nap for about three hours while Nik and kids got food and watched cartoons and stuff. So, by the time we were up, I’m sure the VH-ers had gone off to their dinner. ANYWAY, I felt bad about that, but better safe than sorry, I guess. I would have felt worse if I would have let a kid drown! Kids having their own little room within our room and their own TV helped them cope with my nap. This sounds like all bad stuff, but actually it was a good trip. 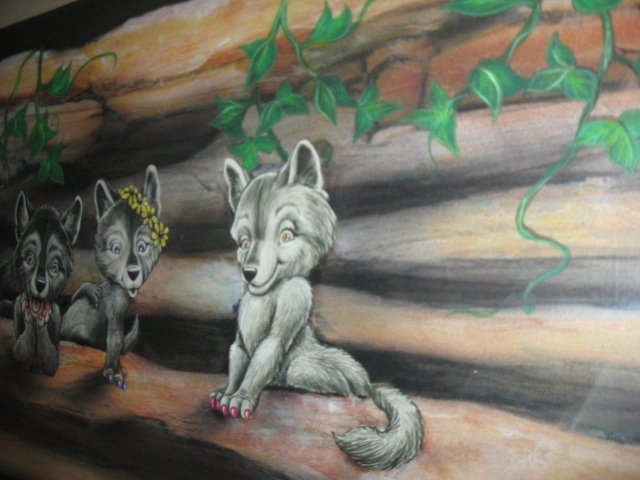 The first day, after cartoons, we went to dinner and the kids were all excited to get wolf ears. Then we went to their story time (after failing to find VHers for games.) I think we had a lot more fun there. 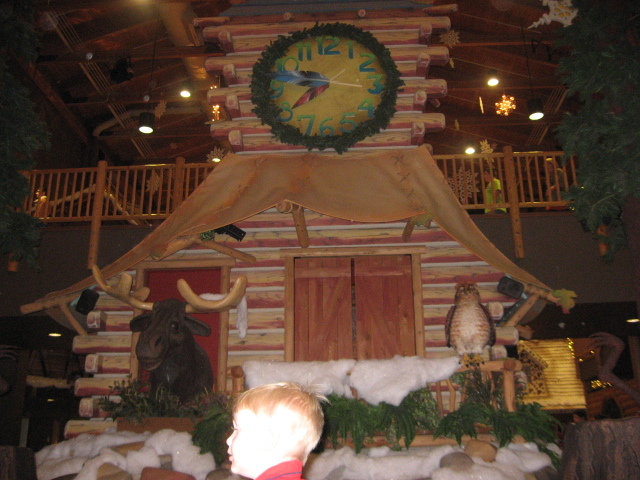 It was like Disney Animatronics. 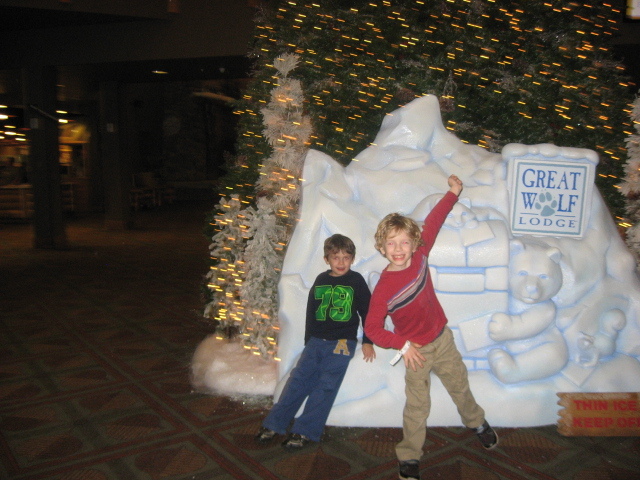 And they had Christmas songs and made it snow in the lobby. Avery had a lot of fun there and clapped and danced and acted like a 2 year old. 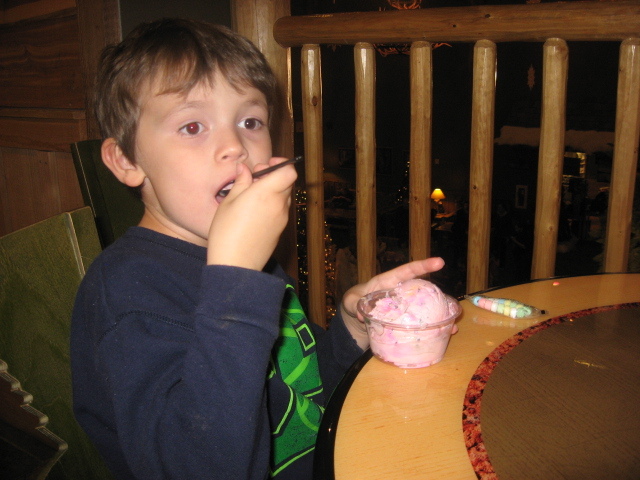 Then I took Avery back to go to bed and the kids and I went back out and went to the arcade and got ice cream and went running down the convention center hallway which was kind of empty. 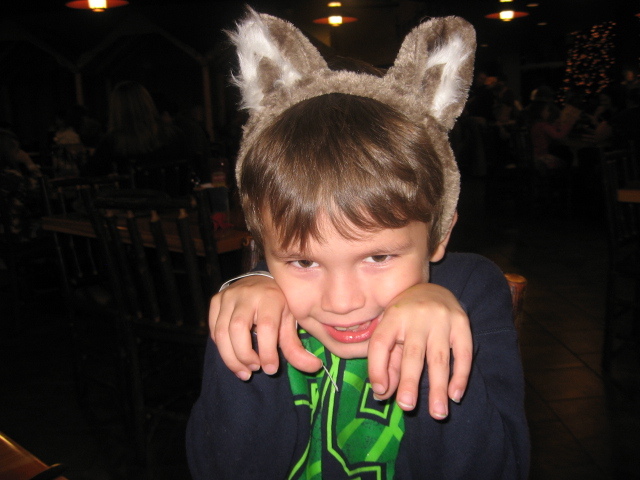 I didn't think Avery would tolerate wolf ears, but he loved them and wore them around for days. Story Time. 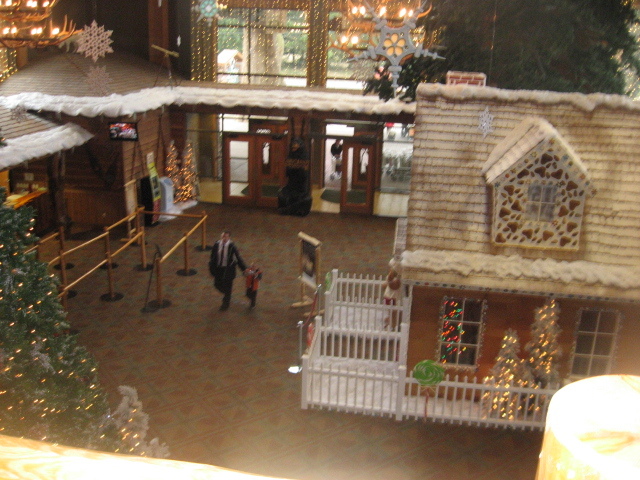 I couldn't get a good photo that showed the snow in the lobby. Hanging out with big kids after N and Avery went to bed. Naim getting his sillies out and running down an empty hallway. Aaron waiting for Naim to run. 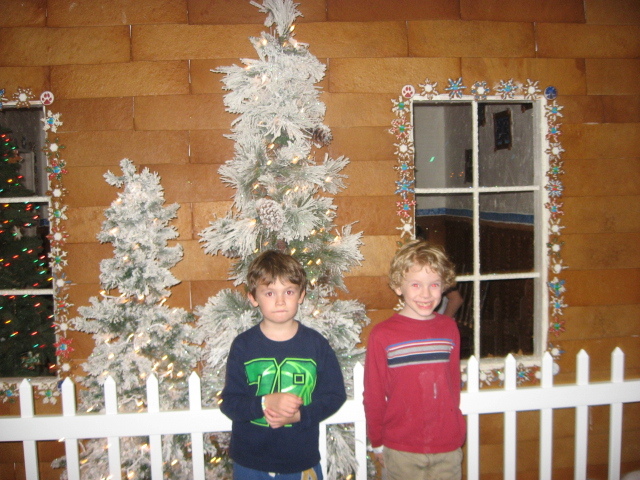 They had a life-size gingerbread house that you oould reserve and eat in, we didn't do that, though. Monday was all watermark, all day. I did not get a lot of pictures because I could not take pics and still watch kids very easily, and not get the camera wet. At first, I watched Avery and Nik watched big kids. 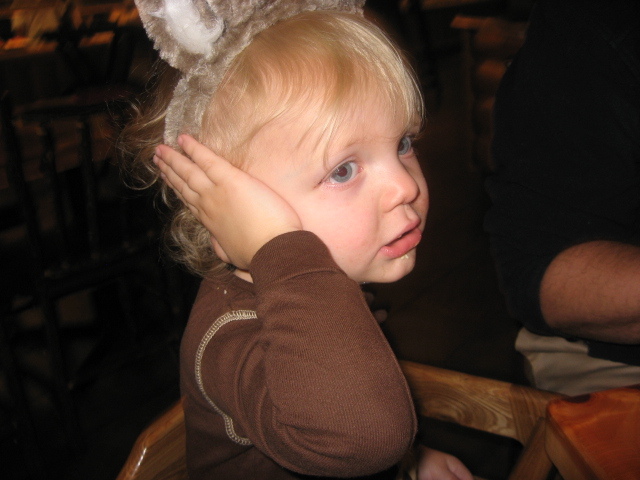 Aaron was afraid of everything at first. They have this HUGE bucket that fills up and dumps a MASSIVE amount of water every 10 minutes or so. Aaron was hugely terrified of this and wouldn’t go near it. We took Avery to the little kid pool and he was fearless. He dumped a much smaller version of a bucket on himself a bunch of times and ran all over that place have a great time. Jet skis that shoot water at you. 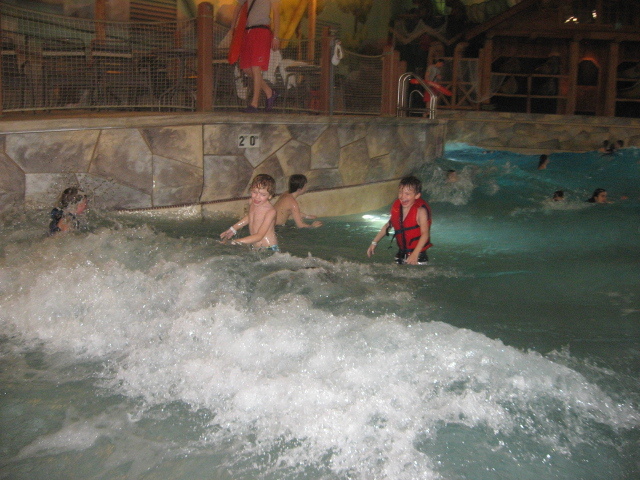 We then took everyone over to a big wave pool. Well, after we waited for Nik to go down one of those water raft slide things. Which worried Naim to no end. 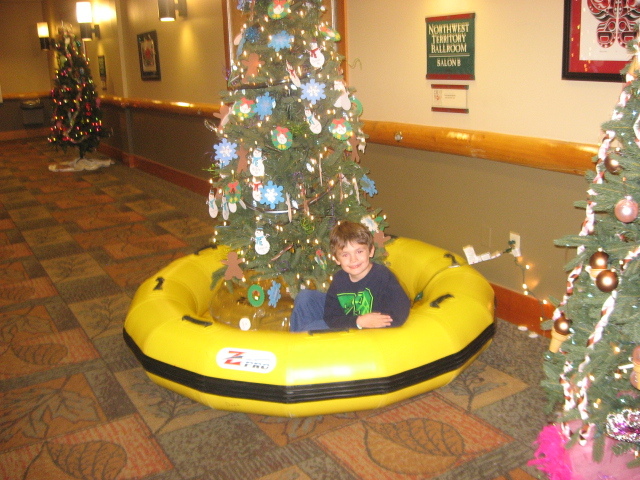 But they would not go with us, and I couldn’t take Avery anyway because he was too short for the height requirements. 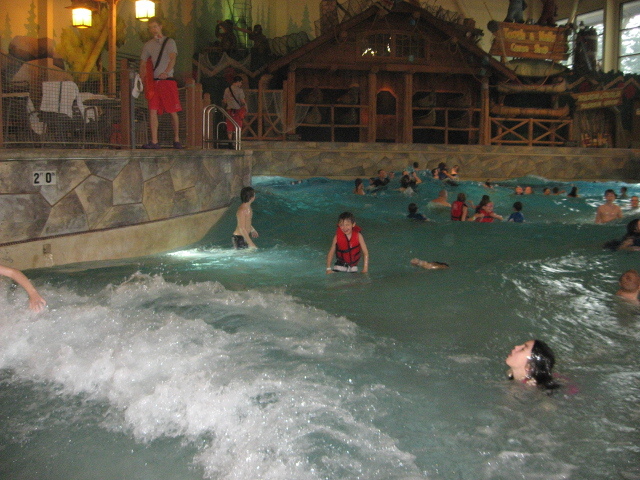 But everyone loved the wave pool. 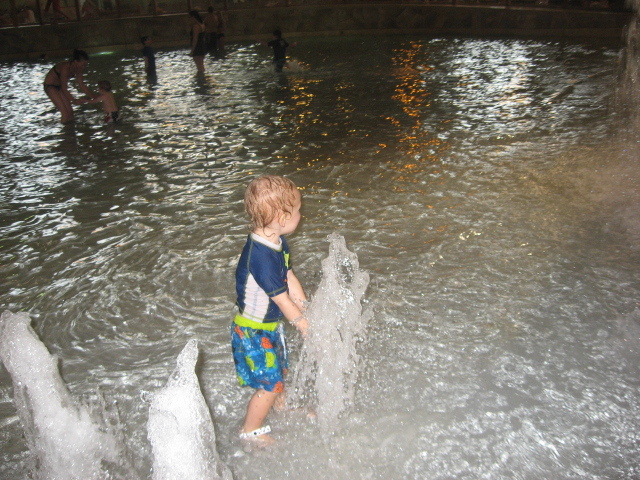 Avery liked being held in the waves when they toppled over him and loved the fountains they had there. I thought Aaron might freak out over the waves, but he thought they were great. Somewhere out there is one of my kids, or two. Avery probably get wetter than Naim and definitely more than Aaron, whose hair was still a bit dry when we finished. Quite an accomplishment in this place. After lunch, I went back with just the big kids. 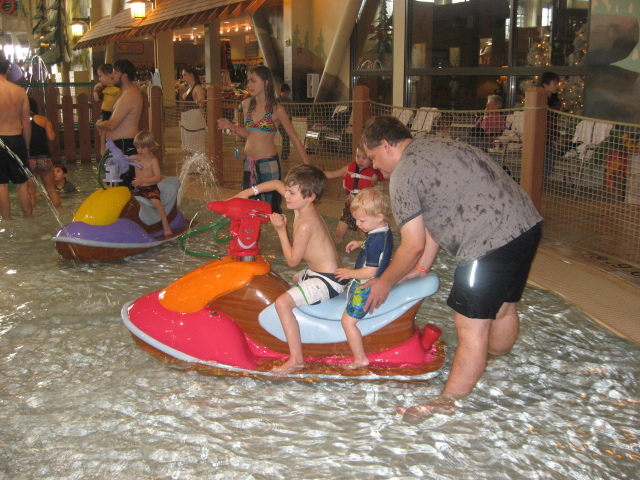 And I got to go on watersides, which reminded me of when we would go in Omaha when I was a kid. They were fun. I was only able to do this with the help of Lisa, because Aaron refused to go. But Orion got Naim to go finally. Peer pressure! Also, Orion is a pretty good swimmer, so I think that got Naim thinking about all the freedom he would have if he could swim better. Aaron is such a wimpy kid, though! Avery is more fearless than he is. 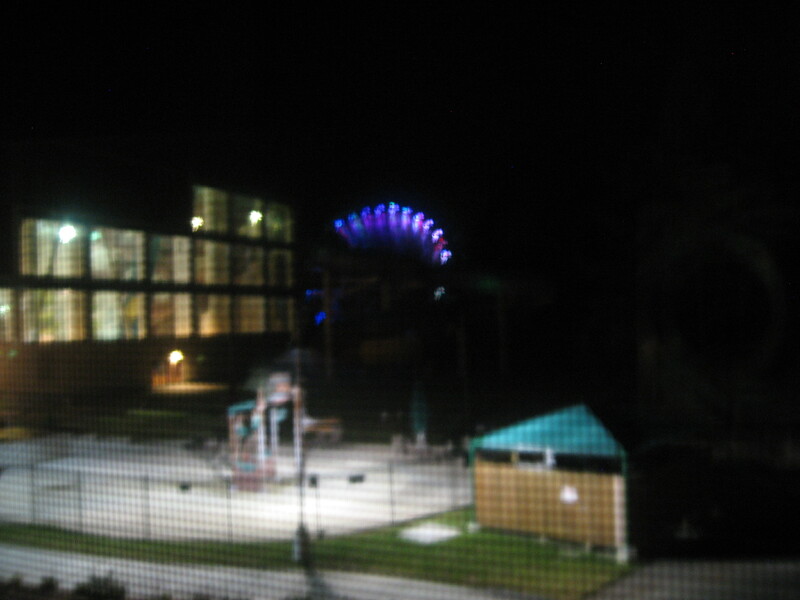 This was out of our room window. I tried to get a picture of that tornado funnel thing. It was huge! You enter these slides inside, but the actual slides come out of the building and go back in. At the art/playroom place, we waited here for a bit for our bus to leave. I think I would go to GWL again, maybe next year or something (not every couple of months like Lisa!) I would try to get us at least two watermark days next time. And I would also try to call ahead and make arrangements for them to store our stuff because that is just not fair. I would also go from Monday to Wednesday because it got so much better and less crowded after Sunday. Also, if the store would have been open on Monday, we could have gotten breakfast and snacks and then saved money. We planned to do that, but everything was closed Sunday, so we came with no food (and can’t carry it all.) Also, the bus we were on stopped by a Safeway, so we could have done that, or got food at restaurants in Centralia on Mondays, which would have been cheaper than always eating at GWL. The buses run longer hours on Mondays. I think I would also let the kids play magic quest, because that looked cool! It was fun overall. Good birthday trip. I’d rather do something like that for their birthday than buy them more junk. Though it is more expensive.